This is a negative Frederick Sommer made with soot, one of his many smoke on glass negatives. 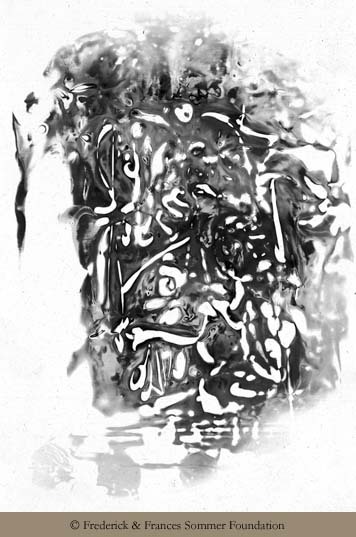 This is the first state, or first-impression, made from a small drawing on foil that Sommer had playfully placed in the stream of smoke fuming from a burning candle. The deposit of soot combined with the relief or intaglio nature of the drawing, created tonal densities and transparencies that rivaled his silver negatives. 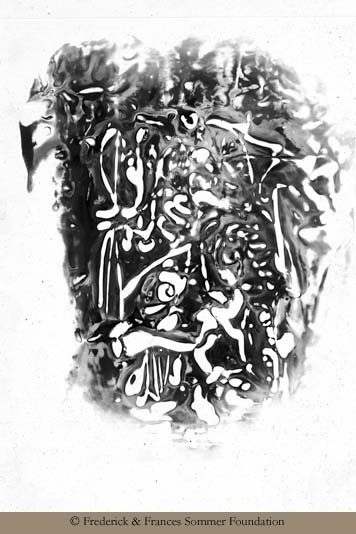 This is the second state, or second-impression, of the same smoked foil drawing. Below, the two are positioned closely together. The original 'synthetic' negatives are housed at the Center for Creative Photography, Tucson.